Behold, a map! I took the results of the hoodies per person survey and MADE A MAP OF HOODIES IN SAN FRANCISCO. How many hoodies do you think exist in this 49 square miles? Some hoods are hoodier than others! Sample size for some zips isn’t ideal, but NW SF is leading the pack. Fog trumps fashion, apparently. To answer @brittneyg’s original question: Can we safely extrapolate? We have a sample size of about 500 responses, with an average of about 4 hoodies per person. I am no Nate Silver, but I think it’s safe to say there are more hoodies than people in San Francisco, especially with that fat tail. If we run with a conservative estimate of 4 hoodies per person, we are looking at over 3 million hoodies in 49 square miles. Thanks again to @brittneyg, @alexismadrigal, and especially @therealWBTC for the poll! I think the average *ownship* is 4 hoodies — but if you are talking about existence, there’s at least 1-2 million “San Francisco” hoodies in Chinatown stores. We explicitly excluded hoodies not yet purchased.. 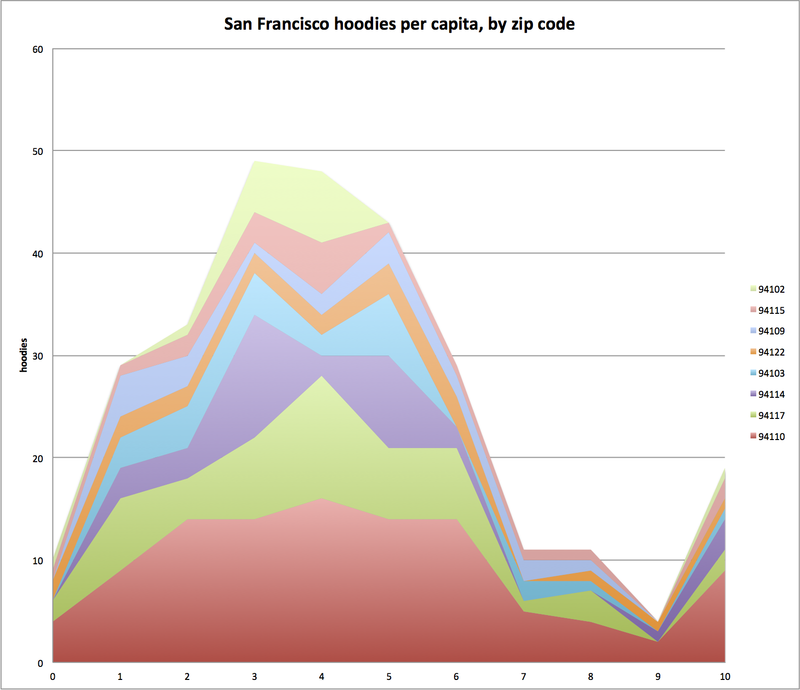 I took the total number of hoodies for the total number of respondents and extrapolated that ratio out to an SF population of 812,826, giving a total SF hoodie population of 3,536,994. 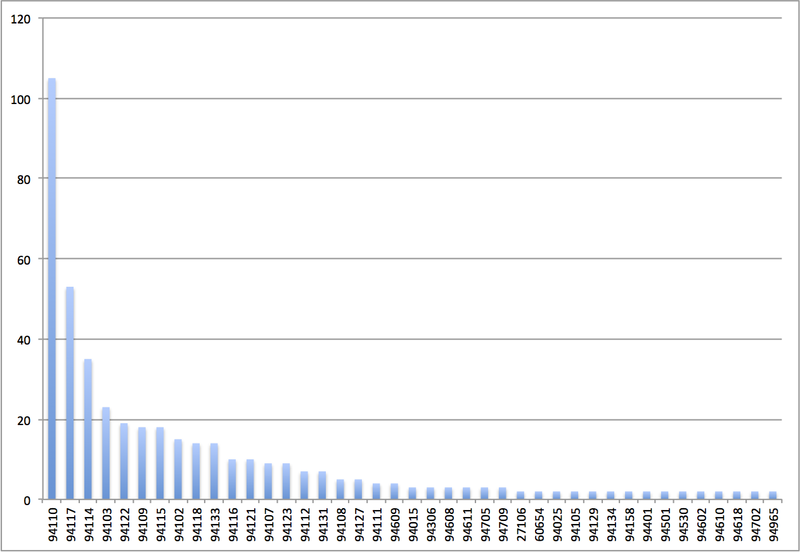 I didn’t include children and pets in that total because (1) children are considered people in the population estimate, so they are already accounted for and (2) it’s tough to accurately extrapolate the pet totals without knowing (i) the total number of pets in SF and (ii) the number of hoodie-owning pets per response. However, the responses to that question were not too significant, with 78.9% of those respondents who didn’t skip the question reporting that their children/pets did not own any hoodies. I would say the fact that your sample shows no hoodies whatsoever in Bayview/Hunter’s Point reveals its basic inaccuracy. I think you overestimate the seriousness or thoroughness of this poll. But you are on to something. The more interesting part about this is the response rate (or lack thereof) across ZIP codes — there’s probably a PhD thesis to be written about blog readership and demographics. Nice. I think we should add hoodie wearers to the next census. I see them everywhere! This is Janefun Garment Weaving Co., Ltd., We (Janefun) are an OEM manufacturing facility, We already have Twenty Years experience in garment area. Our mainly products are Hoody, Gown, Pants, Polo shirt, T-shirt, singlet, tracksuits… Our items use standard manufacturing processes, and we have our very own R&D and Quality Control Professionals. And also raw material random check, material check record, on line check report and also 100% last check prior to shipping. We have established good company relations of cooperation with several renowned brand such as KIK, WIBRA and also WOOLWORTH. Welcome to go to!! Wish our items will be practical for your company. Waiting to working with you. 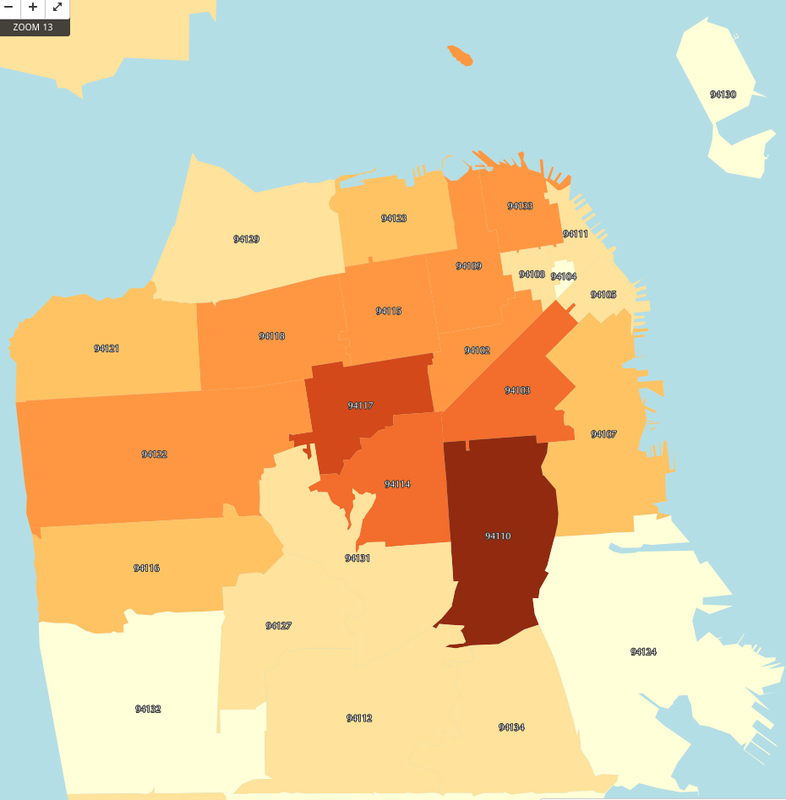 San Francisco Hoodie Map: Which ‘Hood Has The Most Hoodies? | HoodieBlog - Reviews of Hoodies and the latest fashion!